FillPerfect® form filler is a cutting edge tool designed to help people find employment in today's tough job market. It's available instantly for $24.99* (SRP) via electronic download – or shipped on CD for $34.98* (SRP) from http://www.FillPerfect.com. 2424 Software released FillPerfect® form filler Version 2.1, demonstrating America's ability to overcome through innovation. Created by an MIT grad who lost his job in the recession, FillPerfect® brings job hunting into the 21st century. The Internet Explorer add-on delivers unemployment a double blow by accurately completing all types of job applications and by providing instant access to resources vital to every job hunter. With FillPerfect® applications are completed instantly and accurately with a click of a button. No more typing the same information over and over. Simply click Auto-Fill, review, and submit more applications then you ever thought possible. Now job hunters can focus on researching, networking, and interviewing instead of filling out applications.
. . . and other common details on online forms. Not only are applications completed instantly but with FillPerfect® you never have to worry about embarrassing mistakes or typos again. Just enter the information once and you're done. Unlike other form-fillers, FillPerfect® also handles check boxes, radio buttons, and selection lists. And FillPerfect® clearly highlights uncommon and job-specific fields it cannot automatically complete – making accurate review a snap. See how easy it is yourself. Watch FillPerfect® in action on FillPerfect.com and YouTube. For further details, visit http://www.FillPerfect.com. Or call 2424 Software at 281-257-6302 today. 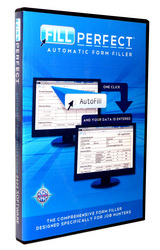 FillPerfect® Automatic Form Filler comes with a 15-day money-back guarantee. It is available instantly for $24.99* (SRP) via electronic download – or shipped on CD for $34.98* (SRP). 2424 Software, LLC develops and sells high quality, productivity-boosting software for home computer users everywhere. FillPerfect® form filler has been shipping since November, 2009. NOTE TO EDITORS: FillPerfect® is a registered trademark of 2424 SOFTWARE, LLC. Suggested retail price (SRP) is subject to change without notice.